2WD RTR Monster Truck Shootout! « Big Squid RC – RC Car and Truck News, Reviews, Videos, and More! 2WD RTR Monster Truck Shootout! While the current ‘hottest trend’ in rc is always changing, we will always have a special place in our hearts for the 2WD Monster Trucks. As bashers, they are an essential part to our heritage, and a large part of the foundation. We get a LOT of emails asking us what vehicle we think people should buy, or if this vehicle is ‘better’ than that vehicle. When you are out driving a vehicle, or when we are doing a review, we sometimes compare one to another based on things we remember. We review a lot of vehicles around here, and sometimes those memories can blur. There is no better way to determine a clear ranking and understanding than to get all the vehicles in the same place at the same time, and put them to the test. There are a good amount of 2WD Monster Trucks on the market, and with a cheap entry cost, we get tons of questions asking about them from our readers, especially the ones new to RC. It can be very difficult to decide based on just the box behind the hobby counter where to spend those hard earned dollars. We decided to take three of the most talked about vehicles on the market right now and put them to the test. Those vehicles were the Traxxas Stampede, the ARRMA Granite, and the ECX Ruckus. Talk about a lot of bashing fun in one room! We tested the vehicles on a wide range of surfaces, in all sorts of locations, and pushed them beyond all their limits. Special thanks to Slot & Wing Hobbies in Champaign IL for letting us do a good amount of our final testing at their new location. We can’t wait to see the track when it’s done! We gathered together four different drivers, of all sorts of various RC backgrounds to put these vehicles to the test! Brian, our editor and chief who’s been in the RC scene since the early 80’s. Tim Mohr, our resident Pro driver who has several national titles under his belt. Craig the crazy ramp builder guy, who lives and breathes the bashing lifestyle. And finally Cubby, who has been the voice of the RC revolution here, and has enough experience to make us all look like newbies! Now before you go hunting around for the results, we’d like to thank all the companies/vehicles that participated! Make sure to check out their full specs on their websites for more information! 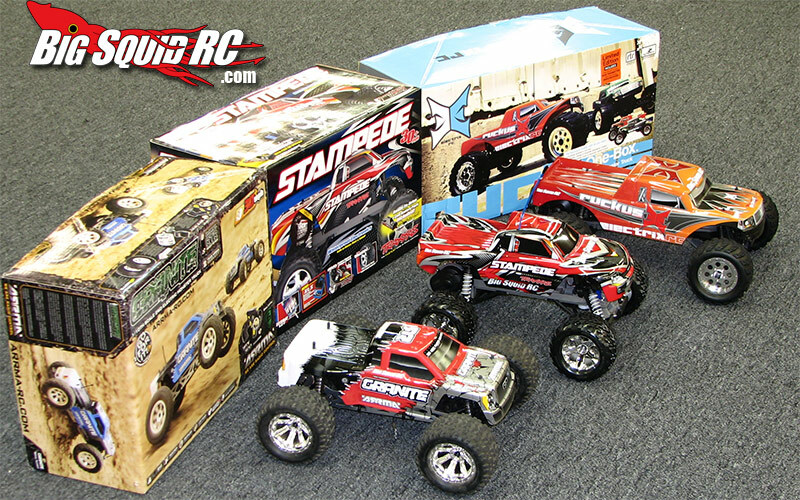 Click here for the Traxxas Stampede. Click here for the ARRMA Granite. Click here for the ECX Ruckus. Ok, enough of the fluff, lets get down to business! 1) Top Speed – How fast do they go out of the box? 2) Pavement Driving – On road is always a option! 3) Loose Surface Driving – Bring on the gravel and dirt! 4) Jumping – Go big or go home! 5) Durability – Who cries for mercy? 6) Ease of Use – They need to be easy to setup and go right? 7) Parts Availability – We broke something, can we get parts? 8 ) Price – How Much Is It? 9) Looks – Don’t want to have to wear a bag on your head at the bash spot? 10) Features – What else can it do? 11) Final Results – Don’t just skip to here! It’s for reference later, seriously! Don’t ruin the book! Now that you know how it’s all going to go down, Top Speed, how fast are they? !